The two lines on the pregnancy test filled me with joy; I couldn't believe at 32 I was finally pregnant and would soon have my own child. My happiness was overtaken by the all day sickness and terrible tiredness. Soon I was diagnosed with pre-eclampsia and so the ordeal started. I was in and out of the hospital, went to weekly clinics, and took daily medication. Finally at 31 weeks at my normal clinic, I was told I was to be induced as I was too sick and my pre-eclampsia had developed into eclampsia. 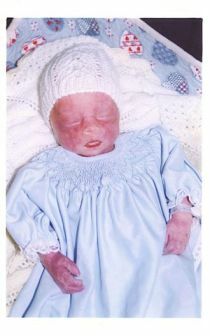 I was ferried via ambulance to a major hospital where a bed was found for my baby in the NICU. I was induced straight away on that Tuesday night. Sometime on Wednesday I had my waters broken. I had had a swab for GBS taken at 29 weeks; it had come back negative. So, even though I had a few of the risk factors, GBS was not considered because it had been ruled out. I had several IV's and so was strapped to the bed until finally my little man arrived at 4:25 am on Thursday, 13th June 2002. He weighed in at 1620 grams and had an apgar of 9 and then 10. I held him briefly before he was taken to the Neo-natal Intensive Care Unit. He was a healthy pink, crying his newborn cry, with a beautiful glow. He had arrived and he was fine. Finally I could sleep and get better. A few hours later the nurse roused me to tell me my son was sick. They asked where his father was so he could come in. I could not comprehend what they were saying. They wheeled the bed to the NICU and I saw a very sick little baby; he was fighting for his life; the blue fingers and toes, the tubes that came from everywhere. I will never forget the doctors saying they couldn't put in another IV because there were no veins left. They thought it was his heart. They called everyone, but it was obvious this little man was going onto the next part of his journey. I kissed his forehead and told him he was deeply loved as they stopped CPR, and just 9 and a half short hours after he was born, he was born again into the next life. No autopsy was done as the pathology report on his blood revealed it to be heavily colonized with Group B strep. I watched as the nurse washed the little body that was my son. The little baby I had longed for and had been so sick for was gone. I would never see his smile, hear his cry, or see him grow. A big part of me died that day. It is a terrible tragedy when a child dies, but the tragedy is compounded when the death is preventable. So many lives would be kept whole if only our little ones didn't have to deal with this terrible bacteria. Thank you for letting me tell his story. William's mother posts re GBS on pregnancy web forums.